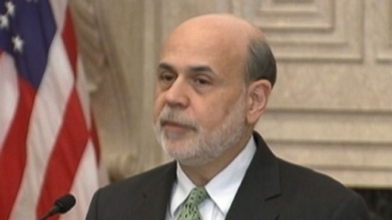 Ben Bernanke lays out a plan to gradually reduce the program over the upcoming year. This is a special group. Report from ABC. Hello -- -- Hernandez in New York with an ABC news digital special report. The Federal Reserve is just wrapped up their two day policy meeting announcing they will cut the 85 billion. The dollar bond buying purchases by ten billion in January stronger US job markets. Is the reason Central Bank originally started quantitative easing program fifteen months -- to kick start hiring and -- An economy that was struggling from the 2008 financial recovery -- -- financial analyst from stands Berry research is joining us live with analysis. So ten billion from the bond buying program dropping down to 75 billion this is. A modest change. It is a modest change also a little bit of a surprise meeting -- in the actual meeting at 2 o'clock and actually broken meeting. There was news coming Edward T percent the news program for southern markets react. But -- ten -- current models and more important -- didn't news accompanying this quarter. I've -- that the exact did not. -- interest rates recently making all for a long time that's based on looking at inflation just below 80% Tressel. Also you're looking at unemployment where when one of the big major parts here's -- -- that unemployment coming below six and a half percent -- for the genocide. Doing away with -- tightening market. -- and previously -- lest they see higher inflation and they're not currency -- that you see that there aren't come down to 6%. Now yeah prospective that based on -- numbers they are not expected to see unemployment below 6% told 20162017. So while the -- didn't get headlines you're looking at regional district court -- basically saying look at an easy policy for at least the next 34 years. OK lots of things to break down here but let's talk about the markets first initially. 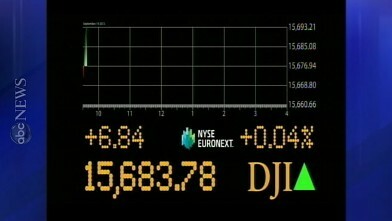 We -- -- tank and then rebounding pretty strongly here we see the Dow up almost a 140 points. What's happening. Well -- -- -- was surprised and I believe that peoples okay the market -- -- are tightening rates and as you know -- reducing -- eat great quantity easing. And every action saturated -- -- and they said that look -- he's going to be -- for a very very -- time. Remarks are reacting positive to get more seamless lower interest rates -- easy money to people you and -- for consumers is -- easier than to lend money are. -- it is actually take money at a bank Saturday. -- bill he content so there's a lot of things that -- keeping -- won't search for a long time. Frank let me. Let me interrupt you for just a second because we're about to hear from the man himself here is fed chair Ben Bernanke. The Federal Reserve's balance -- The committee also clarified its guidance on interest rates emphasizing that the current near zero range for the federal funds rate target. -- will remain appropriate to well past the time that the unemployment rate declines below six and a half percent. Especially if projected inflation continues to run below the committee's 2% longer run go. Today's policy actions reflect committee's assessment that the economy is continuing to make progress. That it also has much farther to travel before conditions can be judged normal. Notably despite significant fiscal headwinds the economy has been expanding at a moderate pace. And we expected growth to pick up somewhat in coming quarters helped by highly accommodative monetary policy. And -- fiscal drag. The job market is continue to improve with the unemployment rate having declined further. At the same time -- recovery clearly -- far from complete. But unemployment still elevated and with both under employment and long term unemployment still major concerns. We've also seen ongoing declines in labor force participation slightly reflected not only longer from influences such as the aging of the population. But also discouragement on the part of potential workers. Inflation has been running below the committee's longer run objectives of 2%. To committee recognizes that inflation persistently below its objective. Could pose risks to economic performance and is monitoring inflation developments carefully for evidence that inflation will move back toward its objective over time. This outlook is broadly consistent with individual economic projection submitted in conjunction with this meeting. By the seventeen FOMC participants five board members and twelve reserve bank presence. As always -- participants projections are conditioned on his or her own view of appropriate monetary policy. FOMC participants generally expect economic growth to pick up somewhat over the next few years. Their projections for increases in gross domestic product have a central tendency. Of 2.2 to 2.3 percent for -- thirteen. Rising to between two point eight -- 3.2 percent for next year with similar growth estimates for 2015 and 2016. Participants see the unemployment rate which was 7% in November. As continuing to decline. The central tendency the projections has the unemployment rate falling to between six point three at six point 6%. In the fourth quarter when he fourteen. And then to between five point three and five point 8% by the final quarter. Of 2016. Meanwhile FOMC participants continue to see inflation running below are 2% objective for a time. But moving gradually back two or 2% as the economy expands. The central Tennessee -- -- inflation projections for Tony thirteen is zero point 921 point 0%. Rising to one point four to one point 6% for next year to between one point seven in 2.0 percent in 2016. Let me now return to our decision to reduce the pace of asset purchases. When we begin the asset purchase program in September 2012 we said that we would continue purchases. Until the outlook for the labor market had improved substantially. In a context of price stability. Since then we've -- meaningful cumulative progress in the labor market for example since we -- the current purchase program. The economy has added about two point nine million jobs -- unemployment rate has fallen by more than a percentage point to 7%. For comparison we started the program many forecasters saw the unemployment rate remaining near 8% throughout 2014. Recent economic indicators have increased our confidence that the job market gains will continue. For example nonfarm payrolls have recently been increasing at a pace of about 200000 jobs per month. And the unemployment rate has fallen by six tenths of percentage point since June. With fiscal restraint likely diminishing with signs that household spending is picking up. We expect economic growth be strong enough to support further job gains. Further FOMC participants now see the risks around their forecasts of growth and unemployment. As having become more nearly balanced rather -- tilted in an unfair -- direction as -- work at the inception of the asset purchase program. As you know we've been purchasing 85 billion dollars per month -- longer term treasury and agency mortgage backed securities. Starting -- new rule we -- east purchasing -- five billion dollars of securities a month reducing purchases of treasuries. And mortgage backed securities by five billion dollars each. It's important to note though that even after this reduction we will be still expanding our holdings of longer term securities at a rapid pace. We'll also continue to roll over maturing treasury securities and reinvest principal payments from the Federal Reserve's holdings of agency debt and agency mortgage backed securities. Into agency mortgage backed securities. Our sizable and still increasing holdings will continue to put downward pressure on longer term interest rates support mortgage markets. And make financial conditions more accommodative. Which in turn to promote further progress in the labor market and help move inflation back toward the committee's objective of 2%. Our modest reduction in the pace of asset purchases reflects the committee's belief that progress towards economic objectives will be sustained. If the incoming data broadly support the committee's outlook for employment and inflation we will -- -- reduce the pace of securities purchases. In further measured steps at future meetings. Of course continued progress is by no means certain consequently. Future adjustments to the pace of asset purchases will be deliberate and dependent on incoming information. Asset purchases remaining useful tool that we are prepared to deploy as needed. To meet our objectives. With unemployment still well above its longer run normal rate which committee participants currently estimate to be between five point to -- five point 8%. And with inflation -- -- continuing to run below the committee's 2% longer term objective. Highly accommodative monetary policy remains appropriate. To emphasize its commitment to provide a high level of monetary accommodation for as long as needed. The FOMC today also enhanced its forward guidance. For the past year the committee has said -- the current low target range for the federal funds rate. Would be appropriate at least as long as -- unemployment rate remained about six and a half percent. Inflation is projected to be no more than half a percentage point above -- 2% -- -- And longer term inflation expectations. Remain well anchored. We have emphasized that these numbers are thresholds not triggers. Meaning that crossing a threshold would not lead automatically to an increase in the federal funds rate. The would indicate only that was appropriate for the committee to consider whether the broader economic outlook justified such an increase. With many FOMC participants now projecting that the six and a half percent and unemployment threshold will be reached by the end of 2014. The committee decided to provide additional information about how it expects its policies to evolve after the threshold is crossed. Based on its assessment of current conditions in the outlook which is informed by a range of indicators including measures. Of labor market conditions financial conditions. And inflation pressures. The committee now anticipates -- -- -- to be appropriate to maintain the current federal funds rate target. Well past the time that the unemployment rate declines to below six and a half percent. Especially if projected inflation continues to run below its 2% -- In part this expectation reflects our assessment. Based on a comprehensive set of indicators. There was still be a substantial amount of slack in the labor market when the unemployment rate falls to six and a half percent. This continuing job market -- impose -- heavy costs on the unemployed. And the underemployed and their families and reduces our nation's productive capacity. Warranting are ongoing highly accommodative policy. But as the last phrase of the enhanced guidance underscores the prospects for inflation provide another reason to keep policy accommodative. The committee's determined to avoid inflation that is too low as well as inflation that is too high. And anticipates keeping rates low at least until it sees inflation. Clearly moving back towards 2% objective. Are forward guidance is reflected committee participants latest projections for the past of the federal funds rate. Although the central Tennessee the projected unemployment rate for the fourth quarter next year encompasses six and a half percent. Fifteen of seventeen FOMC participants do not inspectorate increased 42015. Most see our target for the federal funds rate is rising only modestly in 2015. While three do not see an increase until 2016. For all participants to median projection for the federal funds rate is 75 basis points 2015. And one point -- 5% at the end of 26 team. In summary reflecting -- progress and an improved outlook for the job market. The committee decided today to modestly reduce the monthly pace at which -- is adding to the longer term securities on its Balanchine. If incoming information supports the committee's expectation of further progress towards its objectives. The committee's likely to reduce the pace of monthly purchases in further measured steps in future meetings. However the process will be deliberate and data dependent asset purchases are not on a preset course. The FOMC also provided additional guidance and future short term interest rates. Stating that it expects to maintain a federal funds target in its current near zero range well past the time. That the unemployment rate falls below six and -- spent. Especially if projected inflation continues to run below 2%. The Federal Reserve's enhanced guidance about its policy intentions and a substantial and still increasing holdings of longer term securities. -- ensure that monetary policy remains highly accommodative. Consistent with the pursuit of its mandated objectives of maximum employment and price stability. Thank you -- I think questions. 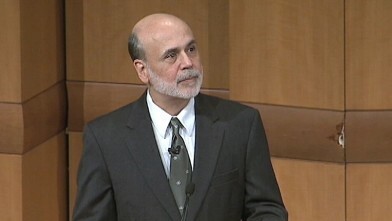 -- just been watching outgoing fed chair Ben Bernanke. Complete his statement about a change in fed policy a major change. The -- -- decided to reduce its bond buying program by ten billion dollars a month. Making it a bond buying program of just 75 billion dollars a month by most accounts a modest. Reduction we're gonna talk to -- -- CO to the little bit more about what Bernanke had to say in terms of its follow up -- did he make any more news in terms of the statement. Actually it was actually even before he actually had a speech on a -- here's -- real -- he says he's gonna keep interest rates low well past time. -- -- it falls under sixth -- percent. As long as we see inflation under 2% now for individual investors people 41 -- it was -- -- and humble interest rate policy for at least another three years because. Consumer prices is the -- they look at for inflation and hate to put our respective. Thanks one point two Purcell and they also look at -- -- which is the -- -- we should exclude food and energy which she's. Now if you Andrea doesn't this food prices going higher -- seeing gasoline prices are extremely -- -- past month but what they're looking at. -- in order her to go to C percent it's a long long time so basically they're saying interest rates is unassailable for a long time is long is. -- -- -- -- So this is good news for Wall Street we see the Dow responding very well up the 200 points since the announcement and and possibly climbing even further. Because essentially what this does is gives a modest taper and some very strong signals -- that -- won't happen again we won't see another taper. For another year to two to three years. Well dictate -- -- bond buying program Craxi fourteen equipment they're not really -- -- interest rates police and anti teacher -- heat outlook -- But the content does get better which one of the things I was surprised that he's seen he's -- -- is far from complete. -- there was a -- what he's found freezer on money is pretty much done under the radar. Shows a household wealth. Is -- -- seven trillion dollars that's a record all time. Since world war -- people more retreated today -- into our own past seventy years so. If you look at this day far from complete I think these policies seat she sees 2009 anybody who owns a home home values it certainly rose. Stock market's -- 125%. Garciaparra royalties -- this is 2009 and even if you own stocks in 2007 before the credit crisis and held right now you're -- your investments. So things are getting better to -- far from complete -- surprised at. But it was worth at -- but overall from an investor's standpoint is very good for the markets he knows it down -- -- -- points during Bernanke's speech because he says listen. Forget I don't know what are Edwards Kennedy is lowest inflation and 80% -- key policy. So frank my last question here we had seen that Wall Street be very jittery over each unemployment report each economics report thinking that this -- might happen. Will -- put Wall Street at ease at least for the short care. I think so. I don't want you take -- -- is that Ben Bernanke and he says in his speech and I think we'll have much fatter. And -- that's why what we're seeing teeth aren't so anyone say recession what we -- and training session and we're going into Christmas. I -- people -- including me that there was a low probability that -- -- -- break. I think he's sending a message and it doesn't matter what time is that we would definitely seeing. A little recovery and that's a good thing and -- and -- -- act. -- at least you know the reason why are -- wife Connie Mack and because the economy growing and now we're looking -- recent burglary next year. And it looks like at least for stocks and equities -- the best asset class city especially interest rates relatively -- Europe. All right thank Helen thank you so much for joining us debris analysis bankers -- financial analyst from stands -- research. Thank you for joining us live and if you want to continue watching the Bernanke news conference he's currently taking questions that continued streaming right here. And abcnews.com. For now this has been an ABC news digital special report. The Fed chair announces that they are curtailing their -- -- program. By ten billion dollars a month time Hernandez -- New York thank you for joining us. Ben Bernanke discusses the importance of the U.S. central banking agency. After the Ben Bernanke announcement, investors watch to see how the market will react. Fed chairman delivered remarks about the economy at Cleveland Clinic.